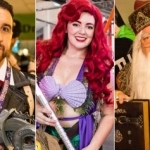 Fandomestic: Who Crafts The Watchmen? 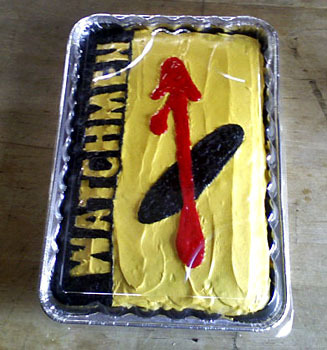 The long-awaited film adaptation of Alan Moore & Dave Gibbons’s Watchmen is released this weekend, so it’s only fitting that we check out some of the crafty things its fans have created. 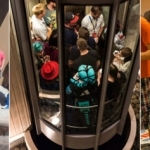 Twelve, to be exact — one for each issue of the original graphic novel. You may recall katipeck‘s previous cupcake art featured on Fandomestic (Lost, Star Wars). She’s done it again, this time featuring the title of the comic, the Doomsday Clock, and the Comedian’s button. 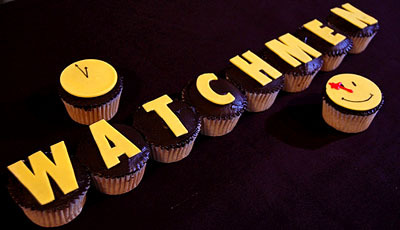 Not pictured: Rorschach-, Comedian-, and Dr. Manhattan-specific cupcakes. 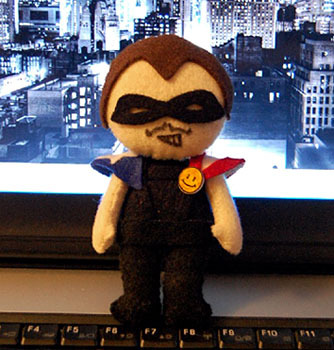 Who knew the pinky-finger-breaking vigilante could be so cute and cuddly? Not Walter Kovacs, I assure you. Especially if he knew pinkninja made it as an anniversary present for her boyfriend. Hurm! 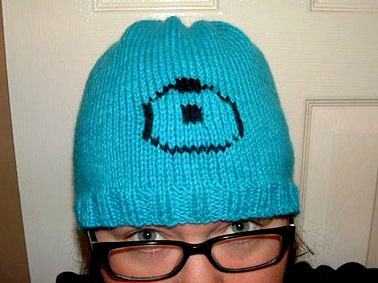 Thanks to the hat she knit, from the eyebrows up, Etsy user holls looks just like Dr. Manhattan! Luckily, not so much from the eyes down. 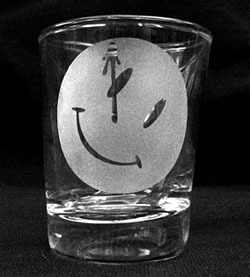 Custom-etched with the famous smiley face button image, this shot glass is available in GoodGuyComics’s Etsy store. 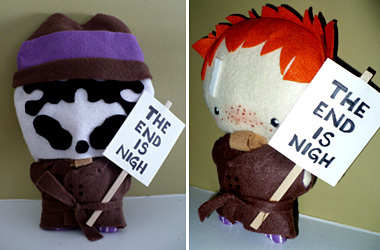 LEGO is unlikely to produce officially licensed Watchmen sets, but that didn’t stop Chris Doyle from making his own. 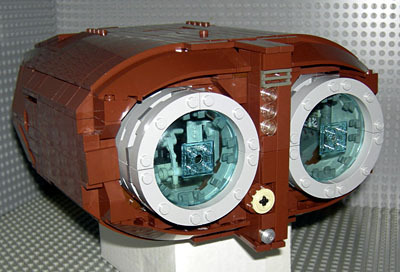 The top of Nite Owl’s Owl Ship lifts off to reveal the interior cabin, complete with controls and seats. 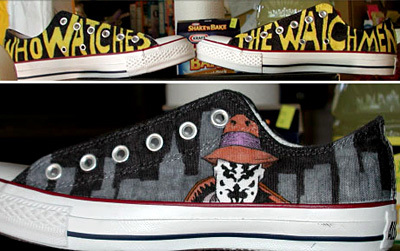 These custom shoes by deviantArt member SakabatoChick feature Rorschach, his alter-ego Walter Kovacs, and two incarnations of his mask, along with the comic’s tagline. 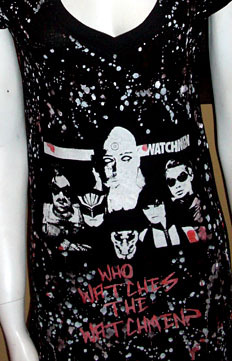 A departure from the bright yellow smiley face you typically find on Watchmen-related stuff, this t-shirt by Etsy member EllenWeldon is instead screen-printed and splattered in white and red with images from the film. 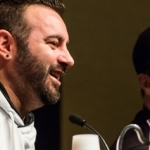 Or, as his creator, AndiMo on Craftster, calls him: Dr. Monkhattan. 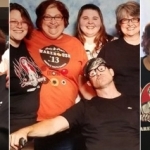 He’s pretty awesome.. and anatomically correct, apparently. 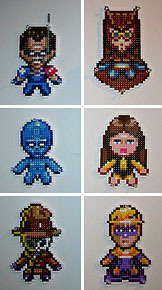 Perler beads are like little round pixels, perfect for making little characters like this Comedian, Nite Owl, Dr. Manhattan, Silk Spectre, Rorschach, and Ozymandias by StephanieGravatt. 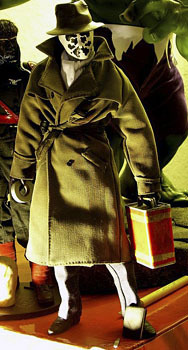 This figure looks so perfect it’s hard to imagine how any manufacturer could have done a better job than DarkArtist81. This slightly macabre cake was made as a birthday present for deviantArt member HeartThrobTawd by a friend.